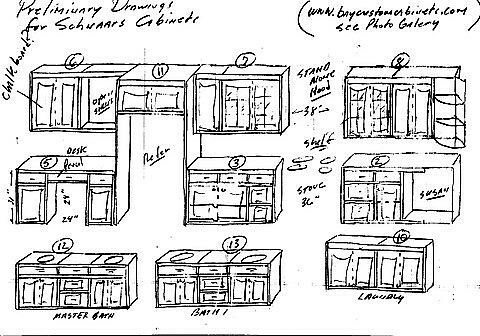 We’ve been having a bunch of conversations with Dan O’Bannon of Bay Custom Cabinets lately. Dan is going to be doing our kitchen, laundry & bathroom cabinets. So far, we really like him a lot and the designs as outlined above are coming along nicely. If you’ve seen the pictures of our soon to be kitchen, you know that we are trying to keep things as open and airy as possible. We are going to be going with a paint grade, but distressed looking white cabinet with a dark gray granite. We want lots of open shelves and glass cabinet faces. Possibly something like this, without the island on wheels (dangerous during an earthquake). Suffice to say, we are really looking forward to Dan’s designs. You guys have a really cool blog and your house is really coming along! I have my own personal blog about home improvements, http://homeconstructionimprovement.blogspot.com and I’ve been searching for ways to meet other home owner blogs and getting more traffic to my own site. My wife found a great way of doing that by joining a couple of blogrolls. The problem is I couldn’t find a home improvement blogroll anywhere, so I decided to create my own and I’m hoping folks like you will try it out and help spread the word. Directions for it can be found at http://homeimprovementblogroll.blogspot.com . The basic idea is when you put the blogroll on your blog you are creating links to other blogs, the good news is everyone that puts the blogroll on their site gives you back links. I hope you’ll try it out and let me know what you think.